Gone are the days of a white cake with a topper. Today there are lots of options and choices. 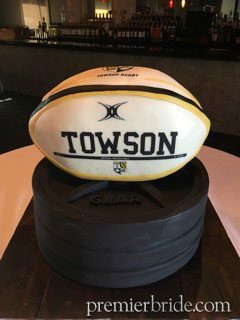 You can have a theme cake, dessert buffets, cupcake towers and let’s not forget the groom’s cake. Cakes and desserts can be highlighted at weddings with flowers and spotlights with gorgeous table setting for all the guests to view. Today, so many bakeries, planners and caterers have an employee who will listen to your wants and budget to make your wedding dessert dreams come true. From cakes with color and themes to tiered cakes with your favorite macaroon, get creative with your desserts. Another option for your cake is to add different flavors. You love lemon, your groom likes chocolate, your parents love banana cream, and your grandparents loves red velvet. You can have it all! Each layer can have its own flavor giving everyone what they want. Let’s not forget adding “extra” goodies to cakes. Macaroons are hot in today’s events. Add a layer of your favorite macaroons and really wow your guests. Macaroons can also be in many different flavors as well. Get creative and let your imagination go. YES, let’s not forget about the men in our lives. Are they a sports fan? How about a favorite hobby, beverage, cigar or car? 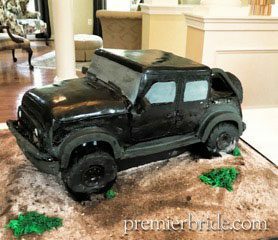 Customize the groom’s cake to fit their personality and make it special. Many today are considering dessert buffets. It’s like walking into a baker with so many choices. Surprisingly a buffet can be very cost effective. You can have a cake surrounded by some of your favorite yummies, s’mores, tarts, eclairs and more. So many choices. How do you put the finishing touches on your delicious desserts? Place back drops that blend with the theme of your wedding behind your dessert table. It’s a show stopper! If you can think imagine it, it can be baked! 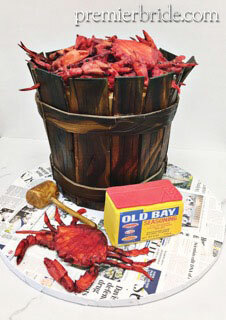 Photos provided by My Sweet Array, The Cake Studio Baltimore, and Le Cake Boutique.